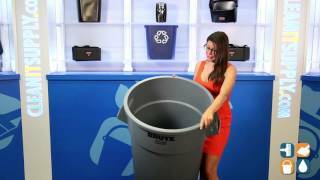 Strong and reliable, Rubbermaid Brute Trash Cans provide a seamless container design. Made of polyethylene construction that won’t dent, rust or leak, these large Rubbermaid commercial trash cans can hold whatever is needed. 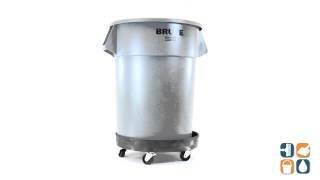 Perfect for any residential, commercial, or industrial environment, these durable Brute 55 Gallon Trash Cans can fit into any outdoor, warehouse or industrial location. The fully-reinforced rim and base increases stability and dragging capacity and has set the standard for Rubbermaid quality. Coming in a sleek gray color, this can is NSF/USDA Approved for food contact and NSF tested/certified. Strong and secure, Brute Round Trash Can Lids are sold separately (RCP2657-88GRA, RCP2654GRA). 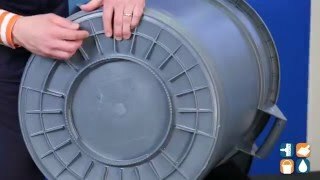 Dimensions for this 55 gallon can are: 33" H x 26-1/2" in diameter.